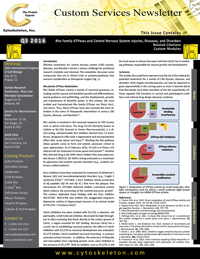 Effective treatments for central nervous system (CNS) injuries, diseases, and disorders remain a serious challenge for preclinical research scientists and clinicians This newsletter discusses some compounds that are in clinical trials or proteins/pathways that warrant consideration as therapeutic targets (Fig. 1). Rho family GTPases control a myriad of neuronal processes, including neurite (axonal and dendritic) growth and differentiation, axonal guidance and pathfinding, and the development, growth, and maintenance of dendritic spines. In this context, the most studied and characterized Rho family GTPases are RhoA, Rac1, and Cdc42. Thus, these GTPases have also received the most attention in the arena of therapeutic intervention in various CNS injuries, diseases, and disorders1,2. Rho activity is involved in the neuronal response to CNS trauma such as spinal cord injury. The drug VX-210 (formerly known as Cethrin or BA-210; licensed to Vertex Pharmaceuticals), is a direct-acting, cell-permeable Rho inhibitor derived from C3 transferase, designed to offer both a regenerative and neuroprotective effect after acute spinal cord injury3,4. Blocking the Rho pathway allows growth cones to form and extend, processes critical to axon regeneration. As of February 2016, VX-210 is in Phase II/III clinical trials for treatment of acute spinal cord injuries4-6. Another Rho-directed drug is BA-1049 which inhibits Rho-associated protein kinase 2 (ROCK2). BA-1049 is being evaluated as a treatment for glaucoma and cerebral vascular disorders (e.g., cerebral cavernous malformations)3. Figure 1. 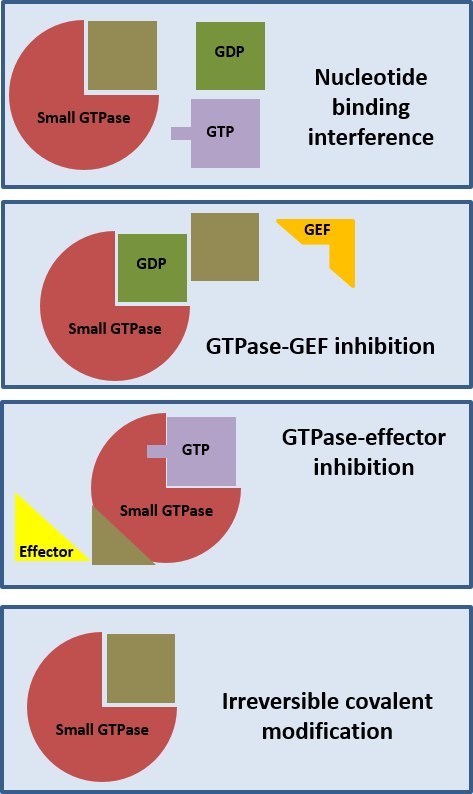 Modulation of GTPase activity by small molecules. Multiple mechanisms exist by which a small molecule (light brown square or triangle) can inhibit GTPase activity. Rac1 inhibitors have been evaluated for treatment of Alzheimer’s disease (AD) and neurodevelopmental disorders (e.g., Fragile X syndrome [FXS])2,7. EHT1864, a Rac1 inhibitor, blocks production of Aß peptides (Aß 40 and Aß 42 ) that form the plaques that characterize AD. EHT1864 indirectly inhibits γ-secretase activity which reduces the processing of the amyloid precursor protein7. The authors replicated these findings with the Rac1 inhibitor NSC237667. NSC23766 also inhibits the exaggerated long-term depression activity in hippocampal neurons of an animal model of FXS (Fmr 1 knockout mice)2. Cdc42 inhibition has been studied with ZCL278, a selective, cell permeable, small molecule inhibitor, discovered by high-throughput in silico screening that binds directly in the surface groove of Cdc42, a region essential for GEF binding. Because Cdc42 has a crucial role in establishing neuronal polarity, the effect of Cdc42 inhibition with ZCL278 on neuronal development was evaluated. ZCL278 inhibits Cdc42-mediated neuronal branching in primary neonatal cortical neurons. In addition, the extension of filopodia and microspikes from migrating growth cones were inhibited in the presence of ZCL2788. With an inhibitor such as ZCL278, it will be much easier to dissect the exact role that Cdc42 has in mediating pathways responsible for neuron growth and development. The studies discussed here represent just the tip of the iceberg for potential treatments for a variety of CNS injuries, diseases, and disorders. Both targets and therapeutics can only be expected to grow exponentially in the coming years as more is learned about how Rho-family (and other members of the Ras superfamily) GTPases regulate CNS functions in normal and pathological conditions and rational drug design advances continue. Cromm P.M. et al. 2015. Direct modulation of small GTPase activity and function. Angew. Chem. Int. Ed. 54, 13516-13537. Tejada-Simon M.V. 2015. Modulation of actin dynamics by Rac1 to target cognitive function. J. Neurochem. 133, 767-779. Fehlings M.G. et al. 2011. A phase I/IIa clinical trial of a recombinant Rho protein antagonist in acute spinal cord injury. J. Neurotrauma. 28, 787-796. McKerracher L. and Anderson K.D. 2013. Analysis of recruitment and outcomes in the phase I/IIa Cethrin clinical trial for acute spinal cord injury. J. Neurotrauma. 30, 1795-1804. Desire L. et al. 2005. RAC1 inhibition targets amyloid precursor protein processing by g-secretase and decreases Aß production in vitro and in vivo. J. Biol.Chem. 280, 37516-37525. Friesland A. et al. 2013. Small molecule targeting Cdc42-intersectin interaction disrupts Golgi organization and suppresses cell motility. Proc. Natl. Acad. Sci. USA. 110, 1261-1266.